As we have discussed quite a bit, there is a lot of confusion over how the rebates will be handled on the 2008 tax returns, both for people who receive checks and for those who don't. IRS has just released this draft of the instructions for the 2008 1040. 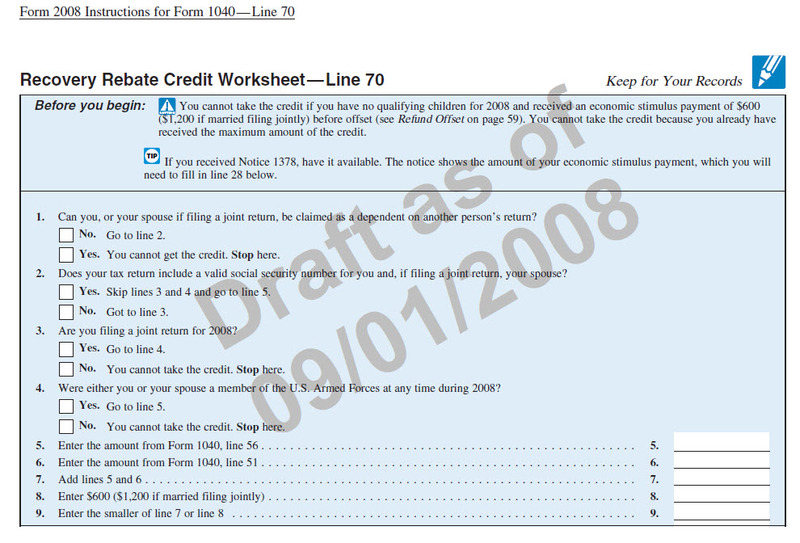 On pages 18 and 19 are the rebate credit worksheets for computing the amounts to enter on Line 70 of the 1040. I used my trusty SnagIt program to create the following images of these worksheets. As we've discussed before, there has been a lot of confusion as to whether or not the advance rebate checks would affect the amount of refund or tax due with the 2008 1040. The IRS website has had conflicting info on this. 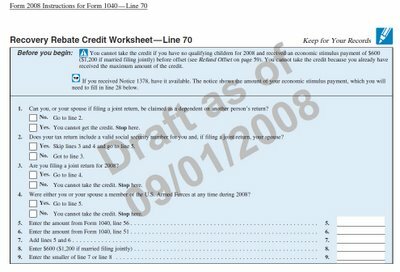 If you check the IRS's draft release of the 2008 1040 form, you can plainly see on Line 71 that there is a place for the "Recovery rebate credit" which should be a positive number for those people who did not receive the full amounts as checks during the year and either a zero or negative amount for those who received checks. This will obviously end up affecting the amount of refund or tax due. As I have been saying, this is exactly the same mechanism as we had for the similar advance rebate payments that we had to deal with a few years ago. People who were claiming that the 2008 rebate checks were free money and would not affect the bottom lines on the 1040s were nuts. As I’ve pointed out on a few occasions, there is a lot of confusion regarding the effect of the stimulus checks on the 2008 tax returns. Not surprisingly, the IRS website has completely contradictory information regarding this, saying both that the rebate will be factored into the net tax on the 2008 1040 and also that it will have no effect whatsoever on the 1040’s bottom line. Obviously, both those claims can’t be true. It has been my contention from the beginning that this will be handled just as we had to do with the similar advance rebate checks a few years ago. People who did not receive their rebates via checks were able to have that amount credited on their 1040s so that they ended up receiving the same net benefit as those who receive actual checks. The tax rebate is an advance credit for 2008 and will be calculated on your 2008 return. Now this is important: you are receiving a portion of your 2008 credit EARLY and if you receive it once, you won't receive it again when you file your 2008 return. And, this is important too: if you're due a higher tax rebate, you'll get the remainder next year when you file. If you received a higher rebate than you should have, you DO NOT have to pay it back. So far, so good. A tax rebate is not interest, it's not income, it's not a dividend. Pure and simple, and this is worth saying again, the tax rebate payment is an ADVANCE CREDIT for tax year 2008 and will be calculated on your 2008 return when you file in 2009. 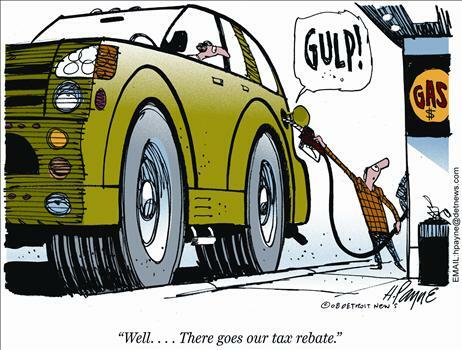 Opting out of stimulus checks? Even before your first blog post about the "stimulus checks", I had learned what a misleading routine that whole thing is. I've been wondering - is there any way to file a 2007 1040 on time (before 10/15/08 w extensions) and still AVOID being issued one of these checks? If they issue one, even if a person doesn't cash it - won't they still say you owe that amount when you file for 2008? And it seems like it might even be possible that they would charge interest on the amounts issued as stimulus checks now. If so, you would end up paying back even more next year... ? 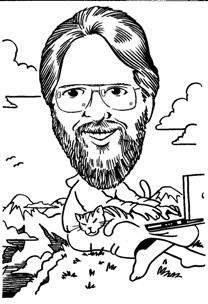 Thanks for all the info and insights you offer in your blog. I hadn't heard of any way to opt out of the stimulus checks other than to file your 1040 after 10/15/08. I just spent some more time browsing the IRS website pages related to these payments and couldn't see any mention of how to have them hold the checks if the 1040 is in by 10/15/08. 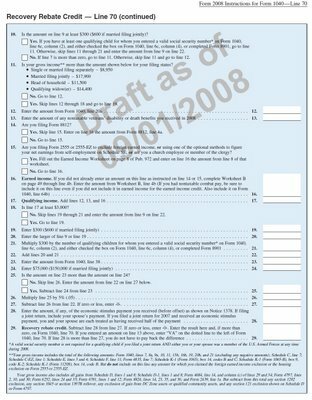 In another example of how disorganized this program is, I saw one page where they claim that the stimulus checks will not reduce the 2008 refunds or increase the tax due, while another page says exactly the opposite, and that those who don't receive stimulus checks because they file their 2007 1040s after 10/15/08 will receive credit for it on their 2008 1040s. I have to believe the latter to be more accurate because this whole project is just like a similar one we had a few years back, where IRS sent out advance checks for one of Bush's tax cuts and then we had a mess accounting for it on the 1040s for that year because many clients who didn't have good records couldn't recall whether or not they had received their advance checks. That resulted in IRS having to change the bottom lines on several 1040s. I sense that we will be in for similar adjustments with the 2008 1040s. Giving IRS the benefit of the doubt, I am hoping that if someone were to end up being underpaid for their 2008 taxes, the 2210 penalty on the amount of the stimulus checks would be waived if requested. They probably won't be as generous with interest charges, given their track record on this matter. I'm glad you are reading my blogs. I wish more clients would so that I could avoid having to repeat myself so often. Our rulers prove once again why the most common oxymoron is "Government Efficiency." The amounts of the stimulus checks depend on the info on the 2007 1040; so IRS can't start that process until they have actually received the 1040 for 2007. The extensions don't have any of that pertinent info; so IRS can't determine the amount amounts of the checks from those. As I said in an earlier post on my blog about this very issue, these rebate checks are not free money. 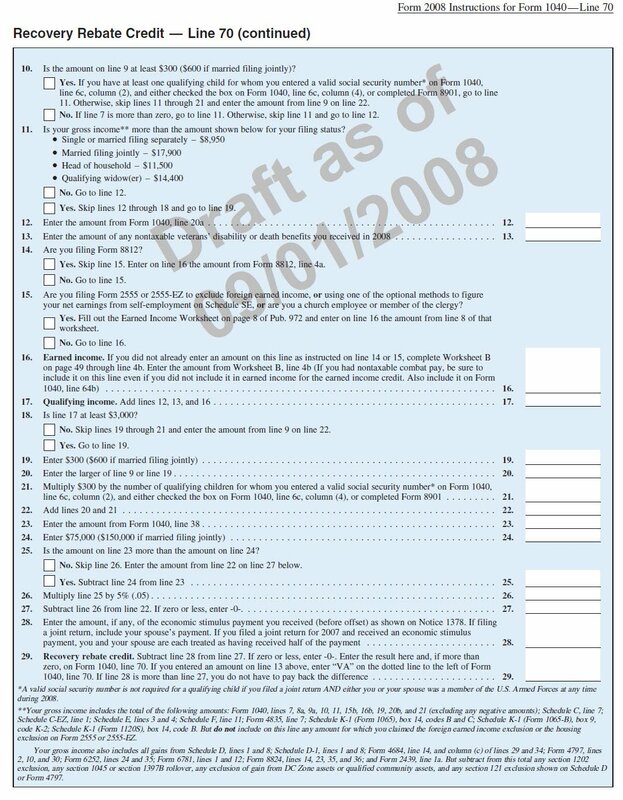 Whether you file your 2007 1040 in time (by 10/15/08) to receive a check or not, it will all equal out. The people who receive these special stimulus checks will end up with smaller refunds when they file their 2008 1040s, or possibly even owe money that they wouldn't have if IRS hadn't sent out these advance checks. In another typical example of keen government intelligence, many people who receive these stimulus checks in the next several months will just end up having to repay that same money to IRS when they file their 2008 tax returns. This whole thing is a Mickey Mouse tactic to try to get people to spend their way out of the recession, when the actual result will be that this money won't even cover the increased cost of fuel for their vehicles, which is the real cause of the recession. 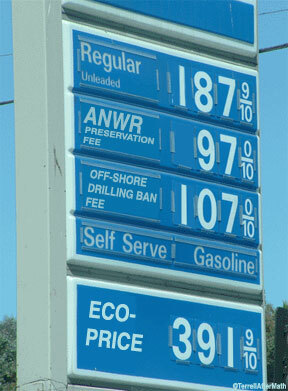 Do extensions affect the upcoming rebates? If I file my 1040 in Oct, does this mean no rebate? 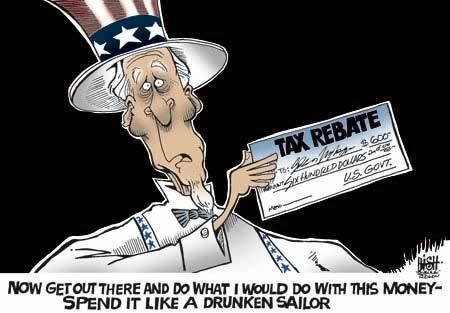 If I do get a rebate is it taxable? Is 2008 the year where there is ZERO capital gains? If so, does this mean that if I sell some highly appreciated stock (held 15-17 years) before 12/31/08 that I will NOT have to pay ANY cap gains? The rebates, which are supposed to be sent to anyone who files a 2007 1040 by October 15, 2008, are similar to rebates we had a few years ago. While not technically taxable as income; they will decrease the refund or increase the tax due with the 2008 1040. It's pretty much the same effect as having $600 less withheld from your paycheck for the year or reducing your 1040-ES payment by $600. If IRS sends you a check for that amount, it will just mean that your refund next tax season will be $600 lower than it would have been. It's a desperate plan to give people part of their next year's tax refund a year early in order to give them some spending money to goose the economy now. People who don't file their 2007 1040s by 10/15/08 will actually be able to have their rebate amounts applied against their 2008 tax return. The special 0% Federal tax rate for some long term capital gains does start in 2008. It's not the entire gain that is subject to the 0% rate; just the portions that would have been taxed at 10% and 15%. Check out the bottom of my web page on 2008 tax rates. On a number of occasions, I’ve mentioned the extremely useful TaxTools program from CFS Tax Software that I have been using for decades to fill in the gaps for items that the Lacerte tax programs didn't handle, including quick loan amortization schedules. During the most recent update a few weeks ago, I noticed they had added a module to calculate the expected amount clients will be receiving in the upcoming rebates that the Feds will be mailing out. I just received an email from CFS announcing the availability of this module for free directly from their website. Understanding the purpose for the rebates?